The theme of the previous post concerned how human diseases could be triggered by environmental compounds with slow and subtle effects, with an emphasis on those which occur naturally. (The interest in natural exemplars of such effects arises from earlier posts on ‘Natural Molecular Space’). A principal theme in this follow-up post will be comparing cancer and cellular degeneration induced by environmental agents. With the exceptions of Polonium-210 and asbestos, the ‘subtle poisons’ considered previously were neurotoxic organic molecules. But organic cancer-causing compounds have been described for a long time. The first description of an association between a specific cancer and an industrial (work-related) activity dates back to the 18th century, when a rare form of scrotal cancer was linked to chimney sweeping. From the time of publication of this finding, it took almost 160 years for science to advance enough such that the active component in soot and coal tars was identified as benzo[a]pyrene, a polycyclic aromatic hydrocarbon. Certain other such polycyclic aromatics are also carcinogenic, and they are thus known collectively as PAHs. Of course, we now know that a whole zoo of both natural and artificial compounds can induce cancer, with varying degrees of potency. It isn’t the intended scope of this post to review a great number of specific cases here, but among the natural set of known carcinogens, an important group are derived as secondary metabolites of various fungal organisms (metabolic products which are not essential components of fundamental life-support processes). While some secondary metabolites (such as antibiotics) have been extremely beneficial to humans, a ‘dark side’ of such secondary metabolism also exists. Not all toxic fungal products (or mycotoxins) are proven carcinogens, but some most certainly are. Probably the most significant in economic and human disease impact are a group of closely related compounds called aflatoxins, produced by various species of the fungal Aspergillus genus (most notably A. flavus). Aflatoxin B1 is the most potent known natural liver carcinogen, and a major problem as a side-effect of fungal contamination of foodstuffs, such as peanuts. Sometimes it is the case that carcinogens are not directly found in certain natural food materials, but are actually formed during cooking processes. There is a certain irony here, because on the whole, cooking of many foods is beneficial through the killing of potentially dangerous parasites, especially those harbored in raw meat. And apart from the generally detrimental effects of parasites on health, a number of such organisms are themselves directly linked to the generation of specific cancers. Yet during ordinary cooking of meats, carcinogenic heterocyclic amines can form, and if charring is involved (as with barbecuing), polycyclic aromatic hydrocarbons can be created. Among the latter is found benzo[a]pyrene, the same compound of chimney sweep fame as noted above. Strictly speaking, carcinogens formed by cooking are not ‘natural’, since they require human intervention for their formation. Indeed, cooking itself has been considered a useful marker for distinguishing humans from all other organisms, including our primate relatives, and may have even shaped evolutionary pathways leading to modern humans. Still, while carcinogenic compounds resulting from cooking clearly arise from human agency, their formation has always been completely inadvertent, and occurred long before the faintest glimmerings of modern chemistry. Subtlety of effect, at least as measured by the time between exposures and onset of disease, is practically a by-word for carcinogens, as well as the ‘subtle’ neurotoxic agents considered in the previous post. This is not to say that these two broad areas of pathology cover everything where subtlety rears its head, but they may safely be grouped as the major concerns. Beyond this, one needs to consider other physiological systems which may be damaged or negatively affected slowly and subtly by non-biological environmental agents, but not with tumorigenic outcomes. One case in point is the immune system, and there are precedents for natural compounds with immunosuppressant qualities. In this respective, it should be noted that toxic compounds can have multiple effects, and aflatoxins (for example) have immunosuppressive activity as well as their other noxious manifestations. Reproductive systems can be adversely affected by natural phytoestrogens, as considered in more detail in a previous post . These other issues aside, cancer and toxic neurological disease can be seen as book-ends in terms of the gross effects leading to divergent pathological results. Let’s consider this statement a little further. A toxic challenge will by definition perturb normal cellular functions. Following such an event, broadly speaking three things can happen. Firstly, an affected cell may, through its endogenous repair system, correct the damage and resume its normal functions. Failing this (in the second alternative) it can die, through a number of alternative mechanisms noted in the legend to the figure below. The best-defined form of directed or ‘programmed’ cell death is the process termed apoptosis. But if death itself should fail and replication continue, chromosomal changes induced in the cell may eventually lead to ‘transformation’, where the normal controls on growth are circumvented and a tumor phenotype acquired, the third possible outcome. Successive genetic changes can accumulate, and transformed cells with invasive properties become amplified through their enhanced growth and survival properties. It is no accident that important genes regulating apoptosis are frequently mutated in cancer cells. If checkpoints on cell growth are removed through blockade of cell death, barriers to transformation may be greatly reduced. Indeed, while most carcinogens are also potent mutagens (inducing genetic mutations in genomic DNA), some are not. The latter have been a long-standing puzzle, but it has been shown that non-mutagenic chemical carcinogens are direct blockers of apoptosis, thereby allowing cells with mutations (normally removed by apoptosis) to persist and proceed down transformation pathways. As noted in the previous post, recovery from a toxic insult might not necessarily be complete, in the sense that the post-toxic state may be sub-optimal relative to the norm, predisposing the cellular victims to future risk. But leaving such complications and the general area of damage repair aside, the major enduring pathological consequences of a low-level toxic assault revolve around cancer vs. degeneration. These outcomes might seem like diametrically opposed processes, since in one case cells grow wildly without normal constraints, and in the other, they die. While the final end-points are clearly quite divergent, it is interesting that the factors which push cells along these pathways have many regions of overlap. Genetic analyses have shown that many mutations which predispose towards Parkinson’s disease are also associated with certain cancers. But toxic chemicals can also have dramatically different effects depending on the cellular context in which they act. A specific genotoxic (DNA-damaging) compound found in cycad plants (methylazomethanol) can induce neurological damage and degeneration in mice without tumor formation, whereas a high frequency of tumors are induced in the colon. Major determinants of the outcome of such toxic challenge are the levels of appropriate DNA repair enzymes (the effectiveness of the DNA damage response), and differential effects on cellular signaling pathways. Up- or down-regulation of specific pathways operating in diverse cell lineages can evidently result in outcomes as distinct as death or degeneration. A clear distinction between neurons and most other differentiated cells is their cell division status, where non-dividing and long-lived neurons can be contrasted with lineages with active turnover through cell division. Neurons thus permanently exit from the cell cycle into a ‘post-mitotic’ state for the lifetime of the organism. Outcomes of mutational damage through low-level genotoxic exposure for neurons vs. non-neuronal cell lineages. In both cases, repair mechanisms exist, which may be insufficient to deal with the problem. Dividing cells may then be diverted into a programmed cell death pathway (usually apoptosis) and thus removed. In a population of renewable replicating cells, this is unlikely to be a direct problem, and of course eliminates a potentially dangerous altered cell. Yet if the shunt towards apoptosis fails for any reason, the altered cell may continue to proliferate and acquire further mutations, with the ultimate consequence of malignant transformation into a fully cancerous phenotype. For neural cells, beyond a certain damage threshold, death is inevitable, even for stimuli that normally promote mitosis in other cell types. Note here that cell death in general can occur by at least three mechanisms, shown specifically for neurons in this schematic. 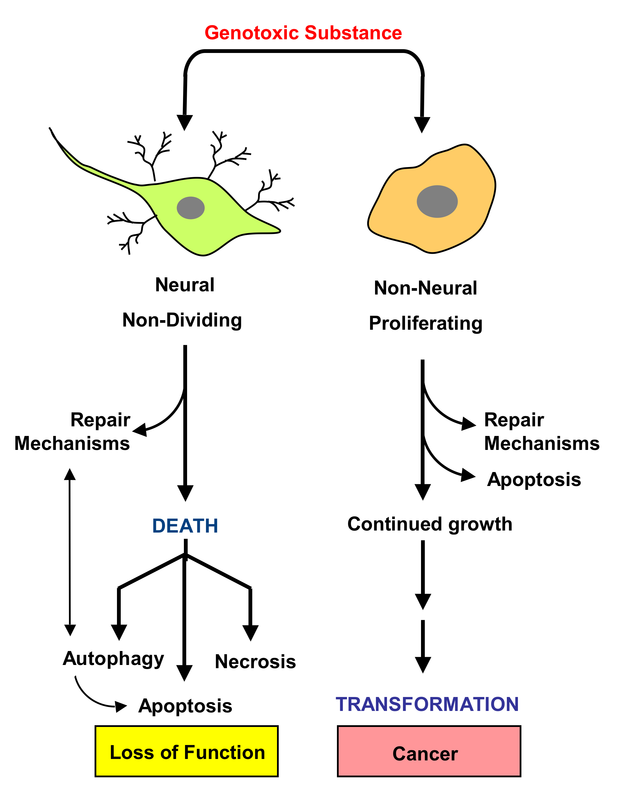 The process of autophagy (a kind of self-recycling of cellular components) is associated with repair processes, but can also constitute a specific cell death mechanism in some circumstances. Apoptosis is a programmed form of death operating through specific cellular signaling interactions, and autophagy can interface with some of these apoptotic pathways (as shown by arrows). Necrosis was originally categorized as non-specific and passive cell death brought on by severe physical or chemical insults. While cell death in such a disordered manner is presumably still a possibility, recent evidence has shown that at least one form of non-apoptotic ‘necrotic’ cell death is also a regulated process, which has been duly termed ‘necroptosis’. In any event, unlike loss of cells with a high mitotic turnover, death of non-dividing neurons will ultimately have significant functional consequences. And yet the above figure might, upon further reflection, appear overly simplistic. Two pieces of extra widely-known information are relevant here: neurological tumors, and neurological plasticity. If neurons die upon transformation, what is the source of brain tumors? And what about the considerable publicity which has been given to the previously unsuspected potential for recovery from substantial brain damage, indicative of ‘neuroplasticity’? In both cases, a simple answer is that neither the ‘dark side’ of neural tumors nor much brighter prospects for neural regeneration derive from irrevocably post-mitotic cells. In both cases, neural stem cells, identified only relatively recently, may be the central players. With respect to tumors, the “neural stem cell hypothesis” proposes their origin as the source of primary brain tumors, as opposed to metastatic tumors which originate elsewhere but migrate to the brain and grow there. The above figure addresses genotoxic substances, but this does not include other neurotoxic agents such as the compound MPTP, discussed in the previous post owing to its specific role in inducing cell death in the substantia nigral brain region, and thereby leading to induced Parkinson’s disease. As noted previously, MPTP has a distinct toxic mechanism via the enzymatic formation of a specific metabolic product, which is taken up by dopamine-producing neurons. This metabolic derivative then inhibits mitochondrial respiration, leading to cell death. Studies have found, however, that MPTP also has mutagenic properties – or at least, once again, one of its metabolic products is the active compound in such assays. Yet even if MPTP indirectly caused unrepairable genomic lesions in target neurons, the above observations suggest that cell death would still be the case anyway, rather than prolonged growth and transformation. ‘……earlier posts on ‘Natural Molecular Space’….’ See posts from last year of 19th, and 26th of July; the 9th, 16th, and 23rd August; and the 6th September. ‘ ….an association between a specific cancer ….. chimney sweeping‘ This resulted from observations by Dr. Percival Pott (1714-1788) for scrotal cancer in young chimney sweeps, first published in 1775. See Brown & Thornton 1957 for relevant historical information. ‘….the active component in soots and coal tars was identified as benzo[a]pyrene….’ See Ling et al. 2004 for more information, especially including the structure of benzo[a]pyrene-DNA adducts, by which its carcinogenicity is manifested. ‘…..a whole zoo of both natural and artificial compounds can induce cancer…..’ For a review on the diversity of carcinogens (including not limited to organic compounds), see Yang 2011. ‘….an important set derive from as secondary metabolites of various fungal organisms.’ For more information on secondary metabolites, see the earlier post of 19th July, 2011. ‘……toxic fungal products (or mycotoxins)…..’ For a useful review, See Pitt 2000. ‘Aflatoxin B1 is the most potent known natural liver carcinogen….’ See a review by Hedayati et al. 2007. ‘…..a number of different parasites are themselves directly linked to the generation of specific cancers….’ If we consider ‘parasites’ in the broadest sense, then there are numerous precedents of viral and bacterially-generated cancers. But in food-related circumstances, ‘parasite’ will most often refer to various worms, some of which are indeed associated with cancer. For example, see Vennervald & Polman 2009 for a review of the status of helminth worms as carcinogenic agents. ‘…..ordinary cooking of meats, carcinogenic heterocyclic amines can form…’ For details, see Nakagama et al. 2005; and Frederiksen 2005. ‘…..if charring is involved……polycyclic aromatic hydrocarbons can be created….’ See Daniel et al. 2011. ‘……cooking ….. may have even shaped evolutionary pathways leading to modern humans…’ The ‘cooking hypothesis’ has lead to a very interesting book by Richard Wrangham, Catching Fire: How Cooking Made Us Human; Basic Books 2009. ‘……there are precedents for natural compounds with immunosuppressant qualities….’ Although in normal circumstances immunosuppression is obviously undesirable, for some medical applications certain natural immunosuupressants have proved a great boon. Such compounds have proven highly useful for suppressing unwanted immune rejections of transplanted organs, and thereby greatly facilitated the efficacy of transplant surgery in general. These include cyclosporin A and FK506, which form ternary complexes between cellular proteins (cyclophilin and FKBP respectively) and the protein phosphatase calcineurin. See Fox & Heitman 2002 for a review. ‘……while most carcinogens are also potent mutagens…….some are not….’ See Kokel et al. 2006, for presentation of evidence that specific non-genotoxic carcinogens act by suppressing apoptotic cell death. ‘…..many mutations which predispose towards Parkinson’s disease are also associated with certain cancers….’ See Devine et al. 2011. ‘……found in cycad plants…..’ See the previous post for more detail regarding the neurotoxic effects of cycads. ‘A specific genotoxic (DNA-damaging) compound found in cycad plants (methylazomethanol) induces neurological damage ….’ This refers to an interesting publication of Kisby et al. 2011. ‘Major determinants of the outcome….’ Also Kisby et al. 2011, and see as well Barzilai 2010. ‘…..cell death…..’ For further information regarding autophagy, see Kaushik & Cuervo 2006. For a perspective on apoptosis in the light of the recently described necroptosis, see Christofferson & Yuan 2010. ‘……publicity which has been given to the previously unsuspected potential of recovery from substantial brain damage….’ Neuroplasticity has received much popular notice largely owing to the book The Brain That Changes Itself, by Norman Doidge. Viking, 2007. Note that one aspect of neuroplasticity, the ability of neurons to exhibit ‘regenerative sprouting’ from axons, is not the same as acquiring the ability to undergo full cell division. See Weiloch & Nikolich 2006. ‘…..the “neural stem cell hypothesis” proposes their origin…..’ For more information, see Germano et al. 2010. ‘…..MPTP also has mutagenic properties – or at least, once again, one of its metabolic products is the active compound in such assays…..’ See Cashman 1987; and Ulanowska et al. 2007.